Tuesday September 20th Yesterday I spent a lovely afternoon tasting wine at Felton Road, and parked overnight in nearby Cromwell. Some say camping is for mugs. Well I awoke to strong sun, a rising temperature, clear blue sky, and snow on the tops. There’s not much wrong when that’s your breakfast scene. 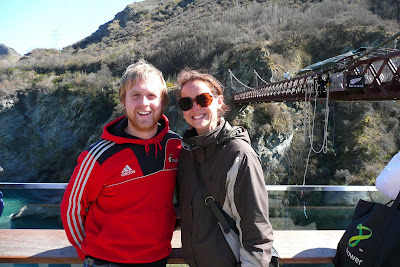 Next, just down the road, is Kawarau Bridge, the location of the world’s first commercial bungy (or bungee) jumping site. I had a coffee, stayed an hour, felt absolutely no temptation to participate, but was happy to watch and chat to those who did. The man in my photos is English and I gathered from his girl friend that he had been desperate to do this, she thinks it’s mad, to pay $180 to drop 43 metres, in a matter of seconds, and then its all over. I certainly agree. I’d rather spend than sort of money on wine: the pleasure lasts much longer and you can share it with others. Still, he enjoyed it and was happy to pose for me afterwards. 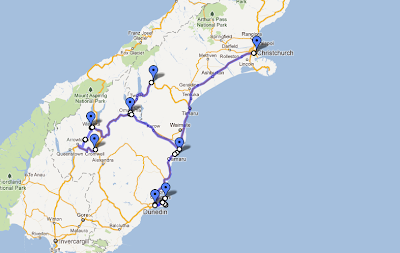 I’ve decided against going to Queenstown, even though I pass within 15 miles. So many Kiwis have told me in the last couple of weeks that it is Partytown, has plenty of activities, but is now very commercialised and not the quiet, chilled place it was. I turn north, heading for the Cardrona Pass, or Crown Range Road as it is more properly known. This is the highest sealed road in New Zealand, with spectacular views, which winds steeply from Arrowtown to Wanaka. It’s a long haul to the top, hairpin bends, with only a couple of small places to stop and appreciate the view. At one of these, whilst taking photos, I see a plane flying at my height, a strange experience when your feet are on the ground. 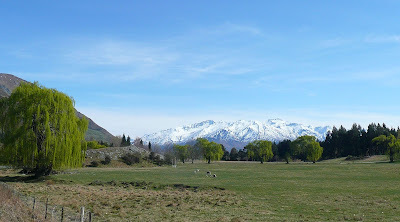 The plaque at the summit records the height as 1076 m - 3530 ft. After the summit the road winds through a long high valley, passing the Mount Cardrona ski resort, and the quaint village of the same name. 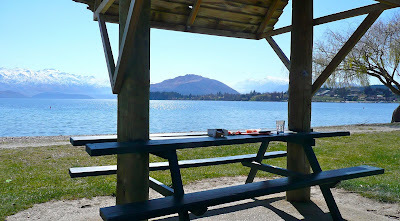 By one o’clock I’m at my destination for today, Wanaka, and stop at the edge of the lake for a picnic lunch. It’s another small town, just 5,000 people, about which I had read this a few months ago “Wanaka is almost unfeasibly pleasant and has to rank as one of the most desirable places in New Zealand”. Based on my 24 hours there I’m prepared to agree. 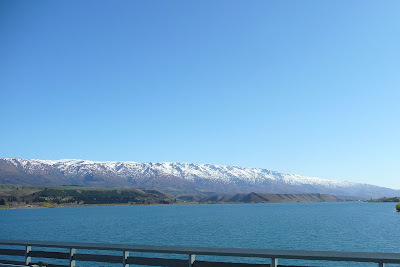 We are still in the Central Otago region, with all the climactic benefits, rich productive land, and fabulous scenery. The town is at the southern end of the lake, and has become something of a tourism resort and activity centre. However, like other places I’ve seen, it is maintained with some class and quality. In the afternoon I head to the edge of town and the Mount Iron Scenic Reserve. This is a “45 minute” walk to the top – it takes me well almost 90 minutes, partly because I continually stop to photograph, and also because local walkers stop to chat. Mount Iron has, of course, been left behind by a glacier. It dominates the town and the summit at 250 metres provides a great place from which to get your bearings, and a great 360-degree view of the whole region. Wednesday 21st Wanaka. Another day, another pass, another lake, the same blue sky, and stunning views. I wake to find two ducks outside my door: I guess they were here before me. Today’s drive is about 145 miles from Wanaka north to Lake Tekapo, but I can’t leave Wanaka without taking a few more shots showing the town and it’s front onto the lake. I am taken by the decent modern buildings, simple parkland, and the way it all fronts onto the beach and water. Another very attractive town. Today I head through the Lindis Pass, often closed to traffic by snow, but today all clear. It is actually much easier than yesterday, no hairpins, and not quite the same long-distance views either. For many miles we follow the path of the Lindis river, again through farming country, this being mainly sheep and at one point I spot hundreds rounded-up and penned. They are waiting to be sheared, and sure enough a few dozen soon trot out of the long shed looking a little sad. Those waiting to go in won’t have long to wait: it seems like a fast turnaround. I have noticed over the last few days some huge steel ‘arms’ on wheels, lying across the fields, obviously some sort of watering system. Today I came across a massive installation, and as it lay right beside the road, I stopped to investigate. I could only guess at the length, easily a mile long, as it straddled the fences dividing the fields. At one end it was coupled into what appeared to be a pump house and feed from underground. What I couldn’t understand was how it moved. 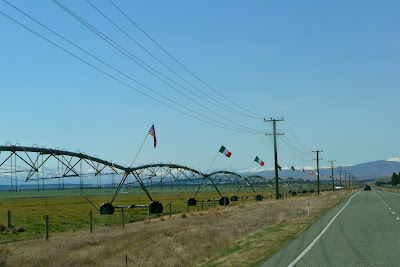 A few miles further, another system, this decorated with the flags of all twenty nations participating in the rugby. A mile again and I came across some engineers at Lake Ruataniwha, who answered my questions. The first installation I had seen is 2.5 kms long. Within each wheel is a small motor, the connections between each section have a flexible rubber coupling, and each one has a GPS link to keep it true and in line. The whole contraption moves in a giant arc, pivoting at the pump house feed. The shape they make on the ground is visible from the sattelites Google earth use for mapping. Fascinating. 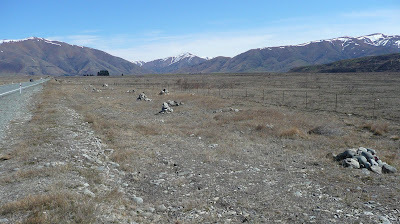 In the long valley before Omarama, where the road runs in a straight line for some miles, I saw some tiny stone cairns standing at the roadside. At first a few, then dozens, over about a mile. What are they? Obscure distance markers? Do they have some Maori significance. When I stopped for diesel I enquired. Apparently some years ago, hitchhikers waiting for a lift had built couple, then a couple more. As word got round more people decided to do their own thing (people in cars, not hitchers) so its now become another modest ‘attraction’. Not having a car I don’t buy fuel at home, but all the Brits I’ve met have been delighted at how cheap the diesel (photo). 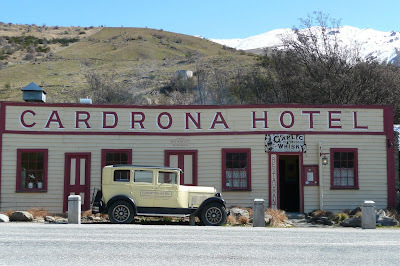 At 3pm I arrived at Lake Tekapo, my stop for the night, and a chance to sit in the sun, write up this blog, and chat with my neighbours. Thursday 22nd Lake Tekapo. Last night I went stargazing. I found this description some time ago and reproduce it here,as it handily explains what I was up to. Apologies: I’m unable to credit whoever wrote it. Lake Tekapo has one of the most spectacular night skies in the world. Visitors from all over the world are amazed by the clarity and numbers of stars visible to the naked eye during Lake Tekapo's night. Canterbury University operates a astronomical observatory on top of Mt John, overlooking the Lake. The clear skies and low levels of local light pollution have put Mt John observatory on the international map with observations and discoveries of the southern sky. Since Mt John was established, the village of Lake Tekapo has grown, so increasing night sky brightness has become a concern. Mackenzie District Council ordinances require that all outside lights be full cut-off so that no light shines upward into the sky. In 1960 the University of Pennsylvania received a grant from the U.S. National Science Foundation to survey NZ to find the best site for an observatory. From here more of the southern sky was continuously visible throughout the year. In 1969 the U.S. Air Force built a satellite tracking station on Mt John. They also funded the sealed road up the mountain and a water supply from Lake Tekapo. The tracking station employed a large staff for following the positions of US and Soviet satellites. The USAF station closed in 1982 as new imaging technology made it redundant and the building passed to the NZ government. Canterbury University now leases the building and has modified it, adding a large dome to the north end to house its one-metre telescope. 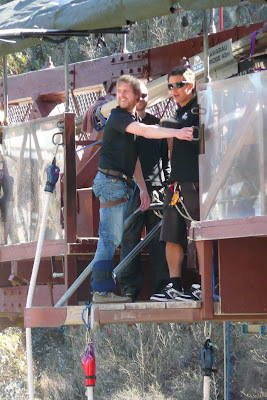 The local company Earth and Sky have the sole rights to access the site and provided the tour facilities for us. http://www.newzealandsky.com/earthandsky/ So I joined about twenty others at 8pm for a mini-bus trip up to the Observatory. Our anticipation of things to come was heightened by the driver turning off his headlights for the last half-mile of windy road (to reduce pollution). We spent two hours up there, very well wrapped up, with some really helpful guides, but I have to admit that much of what they said was lost on my: science was never my thing. I think most of the crowd were knowledgeable about astronomy, some keen amateurs, others perhaps in the business. Additionally, a specialist in astrophotography was on hand so those with SLR cameras (as opposed to point-and-shoot like mine) were able to follow his advice, use his specialist equipment, and obtain some great star photographs. One interesting feature of the evening was that the entire tour takes place in the dark. We were required to turn off mobiles, mask the viewfinders on cameras, and not use torches. The guides use low level red torches to guide us about, but that was all. As we said our thanks at 1030, we all joked that we had no idea what our guides looked like, nor they of us……only by our voices do you know us. I hope my stage-name forbear, John Dee, would be pleased by my endeavours last night. 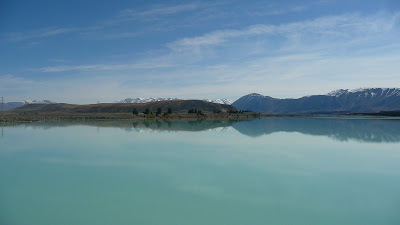 Thursday 22nd: Lake Tekapo Today is Hannah’s 30th birthday, which she will celebrate in London over the weekend with Robin and Ella, Toby will join them, and she’ll also have Susan and Rafa staying. Susan and Hannah were born on the same day, lived about four doors apart in Leeds, grew up together, and both went to London at the same time to study at drama school. Today I had to start my return journey towards Dunedin for the England – Romania match on Saturday. I retraced my steps for about 90 kms to Omarama and then turned east on Highway 83 to Oamaru, where I am spending the night. I was on this site on September 9th – less than two weeks ago. I’ve driven 2,231 kms in two weeks. How much I’ve packed in since then. Today I drove through Aviemore, Duntroon, and Peebles; in Dunedin I have walked along Dundas, Frederick, and Leith streets, Heriot Row and Moray Place. You get the idea: the Scots have a very long, strong, and proud presence in this lower part of the South Island. In my photos of the canal, and later the river, the water really is that colour. Apparently it is a result of the source being from glaciers: in Switzerland they call it ‘glacier milk’. A funny moment today in Oamaru. I wanted to post two cd’s to myself back at home (backing up my photos). Walking through the town I saw the ‘Postie’ shop, clearly identified with a strong white-on-red graphic, crossed the road and walked in – only to find it’s a ladies clothes store. The Post Office is directly across the street, also with a strong white-on-red graphic. Tonight I’m in Oamaru, and I will be eating again in Fat Sally’s (fish and chips) and watching the South Africa – Namibia game on tv. And then to bed. Friday 23rd . A short drive today from Oamaru south to Dunedin, for my third and final weekend in this very nice city. The city of Dunedin stands at the head of Otago Harbour, the south side of which is defined by the Otago Peninsula, a long arm of land reaching about 25 kms eastwards into the South Pacific. The Otago Peninsula hosts the world's only mainland breeding colony of the northern Royal albatross, and is home to the world's rarest penguin, the yellow-eyed, and various species of seals, sea lions and birds. I have been keen to explore this, having read many reports of the wildlife study tours, and my aunt Lily enthusing about the albatross centre, which she visited recently. All the guide books comment on Elm Wildlife Tours, as do many reports on Trip Advisor, as the company to host your visit.www.elmwildlifetours.co.nz So I booked a half-day with them. A small party of us left the city centre at lunchtime, drove out onto the peninsula for about 50 minutes, and made our first call at Taiaroa Head, site of the Royal Albatross Colony, a combination of scientific research centre and tourist observation spot. It’s called Royal, I should add, because that is the particular species of albatross, nothing to do with HMQ ,although Charles and Anne have visited. Our NZ host yesterday wondered aloud if Zara might be visiting, with her new husband’s head tucked under her arm to feed to the birds! Seeing the birds is not a certainty, but is dependent on the weather and the time of their breeding cycle. We saw three, largely immobile, sitting on the hillside nesting. When they did stretch, stand and move we could begin to understand the enormous size of these birds: wing span of 3 metres, adults weigh 9 kgs, and can fly at 120 kph. As we were boarding our mini-bus to move on to the next stage an Albatross flew overhead, coming back in to the Colony, and we could appreciate its size compared to the seagulls also in the sky. Two weeks ago I was in the Southlands Museum in Invercargill and saw a small display about the Albatross. In 1994 a female, ‘Hinemoa’ had been tagged with a radio transmitter. In 13 days she traveled 5601 kms in 13 days- without landfall. 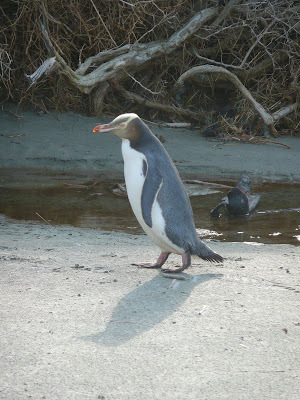 We moved on some miles to a private beach location to view the penguins, a variety known as Yellow Eyed penguins. I’d probably seen a penguin as a child in a zoo somewhere but had no real appreciation of their size, nor of their charm. Look at my photographs to see them alone, watching us, walking, and flirting with a potential mate. These Yellow Eyed penguins are the rarest of the world’s 18 species of penguins and are found only in New Zealand. They go to sea during the day to feed and return to their roosting area in late afternoon (handy for the tourist trade). 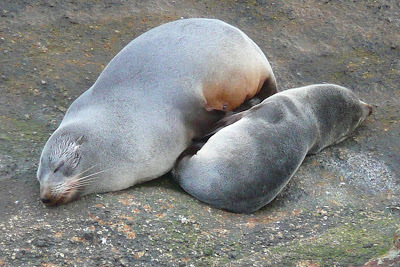 Walking along the beach we came upon three sea sea lions dozing, lions (two m, 1 f) sleeping on the sand. We could approach to within about two metres, stand, observe and chat for 15 minutes, but were warned that if aroused and troubled, they could move at 20 kms per hour. Further along the shore we could see a seal playing in the foam. A steep climb up the cliff took us along a path in the gorse and brush where one little penguin just stood and watched us as we passed by, one-by-one, and each took a couple of photos. He/she almost seemed happy to pose for us. We spent time in a hide, looking down on a fine stretch of beach where we could see more sea lions dozing, untroubled by sheep and lambs wandering by, penguins waddling past, and the inquisitive seagulls. The final climb took us up onto an exposed headland and then down the other side to a small bay of rock pools where there were dozens of Fur Seal pups, some suckling, others learning how to swim in the pools. In the last century these creatures were hunted to extinction by European hunters, but the last few years have seen a large population increase, a successful re-colonisation. Although we were very exposed here to a biting wind, and the light was fading, we hung on for quite some time to marvel at these youngsters at play, before heading back up the headland to find our bus, sitting in the mist. Of everything we saw, I’d have to rate the penguins as my favourites: their style of walking so reminded me of baby Ella’s first steps just five weeks ago – side to side, learning to balance. If you want to locate all this on maps, we started at the Albatross Centre beyond Harrington Point, and then went onto private land on Cape Saunders. Our excellent guide was Sean McConkey. This tour has been awarded New Zealand’s Best Leisure activity, which I certainly endorse. It cost $85 (£42) and was worth every penny. Saturday 24th Dunedin. The RWC organisers have just emailed me to say that they still have some tickets available for the Final. The world economic crisis has undoubtedly reduced the number of sponsors and corporates taking up their allocation of tickets. However much they might talk-up the opportunity, I shall pass on the idea of a single ticket at $1.278 - £641. I’ll be in Sydney, thanks, watching it on tv. A quiet day today. Cooked brekkie in the van, did some washing, and then a couple of hours editing photographs and uploading them. Early afternoon, wrapped up warm and with my England shirt on top, I walked down into Dunedin and had a coffee and cake. Nearly all the small coffee shops have great pastries, which they always assure me they make themselves: another legacy from the Scots? By 4 pm I joined the general drift of fans in the general direction of the stadium but the shower turned to rain so shelter was called for – in a pub. The match was satisfactory in that England beat Romania 67-3, but I’m still disappointed by England’s performance; it all looks pretty formulaic and certainly won’t work when we get to the knockout stages against tougher, smarter opposition. A nice moment tonight: taking my seat in the stadium I found a Kiwi family was sitting behind me, mum, dad, and four-month old son. They say that rugby is like a religion over here; they sure start them young. A brisk walk after the final whistle and I was installed once again at the Alhambra Rugby Club LINK where all visiting fans were welcomed with beer, grub and big tv’s. There must have been over two hundred watching The All Blacks play (and beat) France 37 – 17. The one mile walk home down deserted streets is now quite familiar; this city feels very safe and quite comfortable. Sunday 25th. Dunedin. The clocks went forward an hour during the night so we are now 12 hours ahead of the UK. I packed up quickly, and made a Skype call to speak with Toby. It was great to see him, Hannah and Robin, Susan and Raphael, all sitting round the table in Silk Gardens enjoying wine (and Rafa with a bottle of Fanta!). Goodbye Dunedin, you’ve been a great host to fans from many nations including Argentine, Romania, Georgia, Scotland and England, and you still have the Irish and Italians to come. I’ve certainly enjoyed my time here and the local people have been genuinely warm and welcoming. 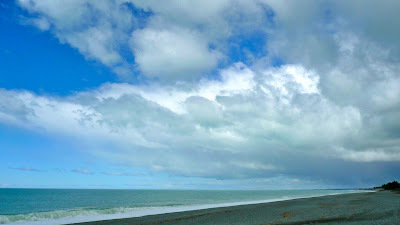 The drive north to Christchurch took about four hours, with lots of traffic and dozens of campervans. I vowed to make no photo stops, but one opportunity persuaded me otherwise: the shot of the ocean and sky (what else) taken at Pareora, just north of St Andrews. After two weeks of driving this van I’ve worked out how to retune the radio – don’t laugh, the instructions run to 27 pages. The result was four hours of classic rock: Phil Collins, Clapton and Sting. In Christchurch I’m back at Amber Park, where I spent my first night in New Zealand – just 17 days ago. Is that all? I’ve travelled so far and seen so much I feel I might have been here at least a month. Christchurch is the largest city on the South Island and is considered New Zealand’s second city. It has a population of about 375,000, and many consider it the most English of the cities. It is called ‘The Garden City’. It is also a rugby stronghold and was intended to host six matches at the Rugby World Cup. The magnitude 6.3 earthquake which hit Christchurch in February 2011 was the most destructive earthquake to strike NZ in 80 years. It caused extensive damage to Christchurch’s central city, resulting in the loss of 181 lives and many injuries, destroyed and badly damaged buildings, forced the closure of businesses, resulted in many job losses and changed the face of the city forever. Up to 50 per cent of the buildings in what is known as the red zone need to be demolished. Wkipedia has very thorough entries on the three Christchurch earthquakes: September 4th 2010, February 22 2011, June 13 2011. The February 'quake is the most significant in terms of both loss of life (181) and damage to the city and the eastern suburbs. Amongst several qualities, Christchurch is flat, making it ideal for cyclists, so this morning I unhooked the bike from the back of my van, and set off to explore the city. One mile of dual carriageway, half a mile across Hagley Park, and I reached the city centre proper at the main hospital, in the south west corner I was hoping to both view the city, and try to see the severe damage caused by the February earthquake, although I knew much of this would be out of bounds. A large central part of the city is closed off to all but essential workers, within a cordon called the Red Zone. Although I had read many news articles, and studied the maps, I wasn’t prepared for the size of the area affected, nor by the enormous scale of the devastation. I worked my way round the edge of the cordon, which covers the very centre of the city. Within this are all the major buildings one would expect: cathedral, banks, shops, large corporate offices for the legal and financial sector, large hotels, churches, department stores, theatre, dozens of shops, and many smaller businesses. It was eerily quiet, little traffic, very few people around, no children at all, traffic lights blinking away to no purpose, the clack-clack of flagpole ropes. The river Avon which flows through the city looked idyllic, with cherry trees flowering and ducks on the water, but just metres away were empty buildings, derelict churches, or already-flattened sites. It is weird to look up at an office building, see furniture inside but no windows. Or to see another such building, all inside left just as it was at lunchtime on February 22nd, untouched now for seven months. Just occasionally I would come across some men working, on what appeared to be infrastructure (cables, telecomms, data). I saw only three tall cranes in the centre. There was the occasional hum of a compressor, the grind of a digger, or the sudden crump as heavy debris was dropped into a steel skip, yet I didn’t see what I had expected: gangs of workers in yellow jackets coming and going. There was some coming and going of engineers, surveors and project managers at the four checkpoints into the red zone. These points are manned by Territorials from the NZ Army. There were a few foreign tourists like myself, looking on in awe; there were as many native New Zealanders, come to look and try to understand. Apparently much of the work to demolish dangerous buildings is being held up by wrangles with and between insurance firms. I’m told that all the major businesses have relocated to work in the outer suburbs. The worry must be that they find life acceptable there and chose not to come back into the centre when it is rebuilt. There is a view that the city had already (pre-earthquake) spread itself in too large a sprawl. The likely result could be denser suburbs and an ‘empty centre’ with few businesses, and little life. Some wise heads are rightly describing this as a once-in-a-lifetime opportunity to rebuild a new, thriving modern city, embracing not only the latest thinking on ‘quake-proof construction, but on best environmental and transportation ideas too. However, the wrangles over insurance could see this taking a decade. The authorities have identified 900 buildings in the central zone that need to be demolished, of which 546 have come down. I heard on the radio that 2,800 children have left education in the city as families move to other parts of New Zealand and that 161 teachers have gone. I had never expected such devastation. It is unsettling just to view it. God knows how those affected really feel. My photographs will better illustrate what I saw than I can describe here. http://www.flickr.com/photos/deedesign/6299340130/in/set-72157628020234464 There is a website here with some powerful photographs taken in the hours immediately after the 'quake hit. Tomorrow I will go to see the eastern suburbs of the city, where over 5,000 properties have been deemed unfit for further habitation.